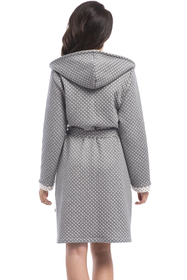 Classic medium-lenght dressing gown created from warm, soft to touch blended fabric. Comfortable cut with long sleeves, belted waist and a hood, it comes fitted with practical pockets while fashionable print adds extra appeal. Perfect for colder season. Composition: 50% cotton, 50% polyester. Available in a grey color. Nightwear made in EU.